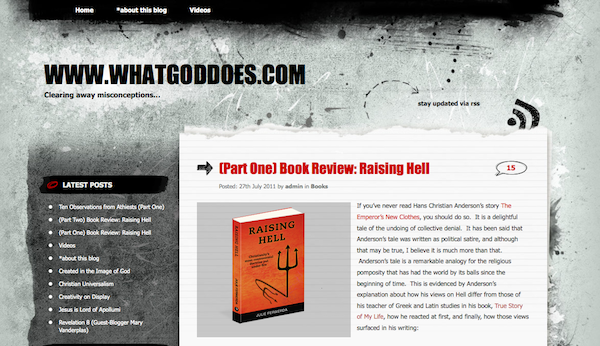 Read the rest of this review and fascinating comments on the blog, WhatGodDoes.com. Have you ever been to church or had a conversation with a religious person in which you asked honest, difficult questions, only to find yourself dissatisfied or disillusioned with the answers they provide? Perhaps you question the existence of God, what it really means to be a “Christian,” inconsistencies in scripture, the moral track record of religious institutions, the fear and terror related emotions induced by eternal torment and wrath-of-God doctrines, how religion’s insistence on tribal and mythological thinking has stumped human progress in science and learning, etc. You want to know how and why it is that a good God seems to have approved of slavery, the degradation of women, genocide, torture, the ill-treatment of homosexuals or people who are otherwise labeled “outcast,” etc. If this is true of you, you are in good company – there are thousands of people all around with world who haven’t entirely given up on their own spirituality but are sick to death of the hypocrisy and hate which seems to inevitably accompany spiritual discussion. This blog is concerned with Who God is and what God does, without all the showy pretenses and quid pro quos imposed by the corrupt spiritual police of this world. 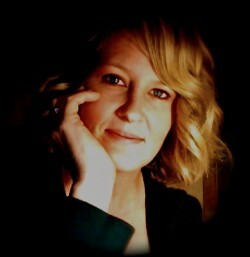 The content of www.whatgoddoes.com will include regular criticism and analysis of church history; contrast/compare ideas in theology, popular opinion, science, and philosophy; review and even pick apart, when necessary, apologetic books, articles, blogs, and other media; as well as creative musings about current events, entertainment, and my personal experiences. I just want to say, What an Amazing God we have. Everytme I read of another person who's eyes have been opened, I jump with joy. Thanks for posting this. She sure is fired up. Thanks again. Wow! I feel famous :) Thanks for the kudos. Can't find where you mentioned that you have an ekklesia on FB. Are you willing to share that? Alternatively, please join http://www.evangelicaluniversalist.com/forum/ and there is an area only visible to members. I bought your book yesterday on amazon and downloaded the pdf to get started last night. It's the best book I have read on the subject (better than Bell and Perry IMO at least for me and where I am coming from). Thanks! Hi Jule, thanks so much for writing your book! Its changing lives and setting people free with Truth :) Your life testimony is so moving, In fact in many ways it is very similar to mine. Have you ever read any George MacDonald (victorian era Christian writer)? Most people don't know who he was, but I recommend grabbing a copy of "Creation in Christ" and sitting down for a wonderful read on what it means to be a true child of our Loving Father. It will touch you deeply…as it is written from a heart of eternal Universal reconciliation, relationship. and triumph! WOW..I do not know where to begin…I may have to send you an email direct to cover what is on my heart. Here is a brief starting point… I have been on a two year journey about trying to find out what God really wants me to do at this point. He already removed me (about 6yrs ago) from the mainline denomination which I served as a deacon for 14yrs. I was connected to a small group of believers that meet every tues. morning to discuss what the Lord is revealing. We started with Steven Jones and I have moved my research to extend to, what I am finding, numerous authors throughout history. Although my own wife does not yet embrace "The Resoration of All Things" I have have had to learn to press on with candor and love. I have also read A.W. Tozers book "The Pursuit of God" at least once a year for almost 20yrs now. There is just something about pursuing Him that leads to truth. OK..I'll stop now and try to get you a direct email to engage a more comprehensive discussion. My end thought is this… I am being called to evangelize this message and have started but, I could use some direction, guidance, prayer and encouragement. This is an open request to all who can help. I am interested in PIPOG…People In Pursuit Of God…. God Bless Us All.